PEET Power: The Advantage PEET powers air through the Air Chambers and DryPorts with a fan, to dry gear faster than our traditional natural convection models. The Advantage PEET dries most footwear in 1-3 hours, depending on the saturation of the item. 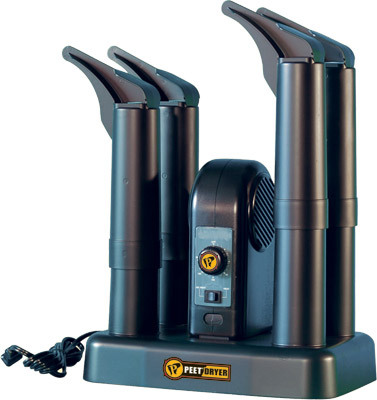 So If you plan to head back to the snow or ice or other extreme conditions after a lunch break, or if you need to dry footwear two pair at a time for a sweaty sports team or a soaked scout troop, the Advantage PEET® Dryer is the model to have.